Wednesday - in the kitchen recipe National Meatball day | A.B.E. Remodeling, INC. Enjoying this beautiful day! Since today is apparently NATIONAL MEATBALL DAY. Did you know that? Bet you didn't - be honest - bet you didn't. Anyway, in honor of the recognized meatball day… the recipe I'm sharing today is of meatballs. On March 9th we recognize one of the great American food holidays, National Meatball Day. It is not clear how this day got started, but who can resist the idea of celebrating National Meatball Day? There are many different ways to celebrate meatballs. There is a restaurant in New York that has 54 different kinds of meatballs. Not only do meatballs allow for variety, but they move from appetizer to side dish to main dish quite easily. Meatballs can be made the night before and put in the crock pot, or days before and kept in the freezer. For more information, visit the National Day Calendar page for National Meatball Day. 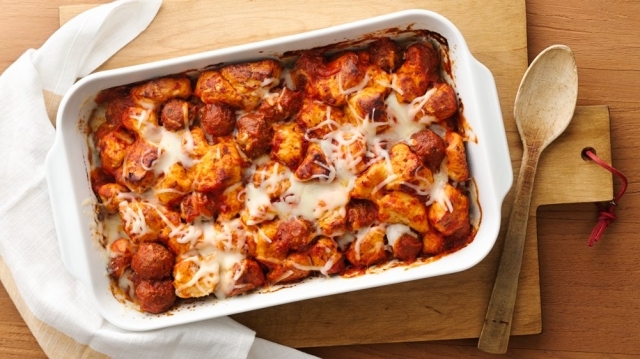 Just four convenient ingredients bake into hearty family-size comfort food! Place meatballs in large microwave-safe bowl. Microwave on MEDIUM for 3 to 5 minutes or until meatballs are thawed. Separate dough into 8 biscuits. Cut each biscuit into 8 pieces; place in large bowl with meatballs. Add pasta sauce; toss to coat. Spoon and spread mixture in sprayed baking dish. Each year on the 9th of March, people across the country observe National Get Over It Day. Just as it implies, National Get Over It Day is to do exactly that, ""get over it""". And there you have it - today's national days.